One of the things we know for sure is we cannot be supportive without being communicative. And the more we can trust, the more we can share what we find to be true, the more profound our ability to advise and ally with people. Cambia is reviewing how we dream and vision. The community is small and reforming and old traditions are being reconsidered by new members as well as founders with new eyes. For me, the piece of greatest interest is the exploration and manifestation of personal dreams. I believe this is a rich place for meme craft and hopefully deep personal satisfaction. This is consistent with Eisenstein’s thinking. That we need to move past dualism and find a new story which connects everything. Craig gets this, which is why he has been pushing this book and the concept of InterBeing. InterBeing, as close as I can tell, is a sort of secular enlightenment, where you feel and react from a place of being connected with everything and seeking some type of harmony with it all. I don’t get it. I am a dualist. This is slightly challenging to the book group I think. Perhaps it is a bit like having a libertarian in your anarchist discussion groups. You are all talking about getting rid of government, but with little agreement when it comes to what happens next. And even though I don’t quite get it around Interbeing, Craig’s challenge feels like a friendly amendment. There is something very powerful about seeking our shared dream together. The alliance is richer when it is our dream instead of you supporting mine in exchange for me supporting yours. This is the one year anniversary of this blog. It means that we’ve had a full year of articles, photoessays, and reprints, all centering on life in egalitarian, income-sharing communities. Part of the point of this blog was to show some of the variety that exists among the communes, from Twin Oaks, which has almost a hundred people and is going to be fifty years old this year, to Compersia, which is small and just celebrated its first anniversary. Someone recently said to me, “Egalitarian, income-sharing communities. How many are there? Eight?” I’ve counted more like eighteen–world-wide–and I feel like that’s just the tip of the iceberg. I know of thirteen US communes, two Canadian ones, as well as one in Spain, one in Germany, and one in Australia–and I keep hearing stories of other ones. She then said, “So what? Maybe twenty, forty communities world-wide?” This is true, but the communes are at the far end of the communities movement. There are thousands of communities of various kinds in the US alone, and perhaps tens of thousands world wide. But we represent what is possible, the radical end of the sharing and equality spectrum for communities. The fact that a community has been able to do this with a lot of people for fifty years and going strong, and the fact that there are a bunch of communities doing this with new communities still emerging is important. Not every community needs to look like this (and it’s okay that only a small percentage do) and, of course, not everyone wants to or should live in a community, but we are showing the world what is actually possible. Unfortunately, not all of the eighteen communities that I’ve identified have been featured in Commune Life. We’ve reached out to all the ones that we know about but sometimes we don’t get replies, or we get responses that they are too busy or they’ll send something “soon” (which probably means eventually). Communal living, especially in the smaller, newer communes, is really busy and often folks don’t have the time or energy to contribute to this blog. I am very grateful for all the folks who have taken the time and contributed with articles and pictures. Also, part of the difficulty of community building is that is doesn’t always work. At least one community that was featured here (Quercus) is completely gone and another one has moved and took over the land of a different, dying community. I’m hoping that we can have their stories in here soon. It’s important to look at what doesn’t work as well as what works. On Wednesday, we’re going to feature photos from all the communities that have contributed to Commune Life. I love the fact that we have so many different pictures of communal living. Finally, Commune Life is also about the projects and organizations that support life on the communes, from the Federation of Egalitarian Communities to the Point A project. I think it’s important to emphasize that you can find out more about any community or project or communal subject (from aging to the Transition Movement) by clicking on the three lines in the top right hand corner of this blog. We want this blog to be a useful tool for anyone interested in any aspect of communal living. I think the most important thing to note is that there’s real people doing communal living. It’s not some pie in the sky fantasy, but an ongoing endeavor of many people around the world. On this blog now is a year’s worth of stuff to prove it. Sustainability is important to many people. Some of the newer income sharing communities, such as Living Energy Farm and the Stillwater Sanctuary/Possibility Alliance, focus on reducing their carbon footprint, but Twin Oaks, a large, older communities, has never been very concerned with this, and still uses almost 20% of the resources of an average American. The reason is that Twin Oaks embraces what Paxus refers to as ‘Radical Sharing’. Twin Oaks has 17 cars for nearly 100 people. (To compare, a hundred average Americans probably have 67 cars.) They share tools and bikes and even clothes, not to mention books and musical instruments and, of course, income. Truly, most communities, even co-housing communities which are sort of at the other end of the spectrum from income sharing communities, do some degree of sharing. 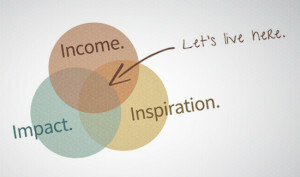 However, most of the income sharing communities, by their very nature, do much more sharing than simply income. Acorn also shares cars and bikes and tools and clothes, as does East Wind. And at new communes such as Cambia and Compersia the work of building the community is shared. I have a button that I wear sometimes that says “Consume Less, Share More.” In the communes this type of radical sharing is a daily reality.